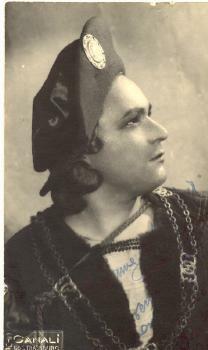 He graduated from the Conservatoire de chant de Bordeaux with the first prize of Opéra and Opéra-comique and began his career at the Grand Théâtre de Bordeaux in 1942 in Georges Bizet's ‘’Les Pêcheurs de perles’’. He also won a second prize at the Conservatoire de Paris in 1943. From 1945 to 1953 he performed at the provincial opera houses (Toulouse, Marseille, Lyon, Lille, Nantes, Rennes and Bordeaux). In 1953 he appeared in Oran. From 1954 to 1956 he was a member of the troupe of the Opéra royal de Wallonie in Liège before being for six seasons the first tenor of La Monnaie in Brussels. Back in Oran he sang the title role of Faust opposite Henri Rivière and Adrien Legros. In 1961 he moved to Toulon, where two years later he retired from the stage.